세종시 연화사 칠존불비상(燕岐 蓮花寺 七尊佛碑像)은 (구)충청남도 연기군 일대에서 발견된 일련의 비상(碑像:비석 모양의 돌에 불상을 조각하거나 또는 글을 적은 것)들과 같은 계열에 속하는 작품으로 반타원형의 곱돌로 만들었다. 연꽃무늬가 새겨진 마름모꼴의 돌 표면에 본존여래상을 중심으로 7존불(七尊佛)이 조각되어 있다. 상단에 옷주름이 새겨진 네모난 대좌 앞면에는 두툼한 연꽃 봉오리를 중심으로 좌우에서 연줄기가 피어 오르고 있고, 끝에는 사자가 웅크리고 앉아 있다. 연줄기 위에 앉아 있는 본존불 좌우에는 협시보살이 서 있으며, 본존과 협시보살 사이에는 상체만 내밀고 있는 나한상이, 밖으로는 인왕상이 사자 위에 서 있는 모습이다. 본존불은 얼굴이 마멸되었지만 당당한 신체에 몸의 굴곡이 드러나지 않게 양 어깨를 감싼 두꺼운 옷을 입고 있다. 이는 다른 비상들과 비슷한 모습으로 삼국시대의 조각전통이 반영된 것으로 보인다. 본존불과 좌우 협시보살은 각각 원형의 머리광배를 가지고 있으면서 배(舟) 모양의 광배에 포함되어 있다. 광배에는 연꽃무늬와 불꽃무늬, 7구의 작은 부처가 새겨져 있다. 삼국시대 조각의 전통을 계승하면서 부분적으로 새로운 요소가 가미된 이 석상은, 조각양식으로 보아 비암사와 연화사의 비상들과 동시에 만들어졌을 것으로 보이며 연대는 문무왕 18년(678)으로 추정된다. 특히 광배의 연꽃무늬나 협시보살의 가늘고 긴 신체 등에서 백제 양식을 엿볼 수 있어 백제 유민들에 의해 만들어진 것임을 알 수 있다. 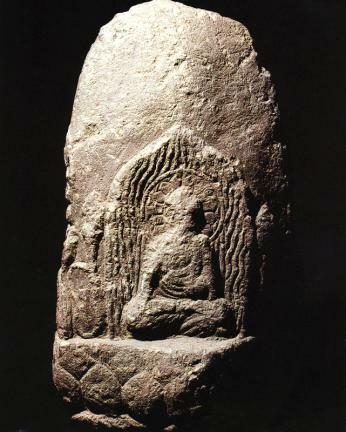 This Buddha statue belongs to the same line as a series of Buddhist stone monuments discovered in Yeongi County. Seven principal Buddha images are carved on the surface of a lozenge shaped stone, centering on a principal Buddha image. Lotus stems rise from the left and right at the front of the rectangular pedestal, the top of which has carved pleats, centering the big lotus bloom, and a lion sits crouching on the end. The attendant Bodhisattvas stand to the left and right of the principal Buddha, who sits on a lotus stem. A statue of Arhat with its upper body projected stands between the principal Buddha and the attending Bodhisattvas, and a statue of Vajradhara is on the lion outside. The face of the principal Buddha is abraded, but with a thick sacerdotal robe wrapping the shoulders, covering the rigid body. This aspect is similar to other stone monuments where the carving traditions of the Three Kingdoms Period are reflected. The principal Buddha and the attending Bodhisattvas have the round haloes and they are included in one mandorla in the shape of a ship. The mandorla has lotus and flame patterns, and seven carved Buddhas. 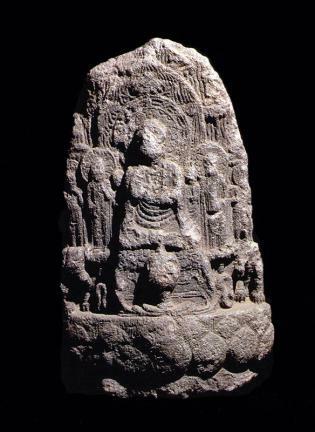 Following the carving tradition of the Three Kingdoms period, this statue has new elements added in part, and this indicates that it was created together with the stone monuments of Biamsa Hermitage and Yeonhwasa Temple, estimated to have been around 678, the 18th year of the reign of King Munmu. The lotus flower pattern of the mandorla and the long, thin body of the attending Bodhisattvas especially show the style of the age of Baekje, suggesting that it was made by itinerant people of Baekje.